AP Polycet Counselling Dates 2018: AP DTE has announced AP polycet 2018 counseling notificaation, Rank Wise schedule, certificates required, processing fee, exercising options and seat allotment details at appolycet.nic.in. The Qualified candidates of A.P-POLYCET-2018 who are desirous of seeking admission into Diploma courses are informed that the web based counselling process comprising of certificates verification will commerce from 17-05-2018 and exercising of options will commence from 20-05-2018. 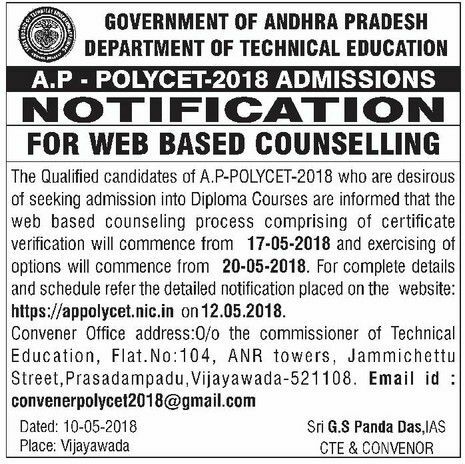 Andhra Pradesh Polycet 2018 Web based Counselling Notification: The Qualified candidates of A.P-POLYCET-2018 are informed that theadmission into Polytechnics will be conducted based on Web based Counselling. The detailed procedure of Web based counselling and other instructions will be made available at https://appolycet.nic.in. 1. S.S.C or its equivalent Marks memo(Original or Internet copy). 3. IV to X Study Certificate or Residence Certificate (in case where the candidate has no institutionalized education) or Residence Certificate of either of parents in A.P. for 10 years in case of non-local candidates. 4. Income Certificate issued on or after 01.01.2015 or white ration Card for claiming tuition fee reimbursement. 5. Caste Certificate issued by the competent authority in case of reserved category candidates. 6. PH/CAP/NCC/Sports/Minority/Anglo-Indian Certificate if applicable. a. In respect of PH category, candidates have to produce a certificate issued by the District Medical Board. Candidates who have disability of 40% and above will only be considered under PH category. b. CAP category candidates have to produce a certificate issued by Zilla Sainik Welfare Officer (In case of Ex-Service Men), Identity Card and Discharge Book for verification. 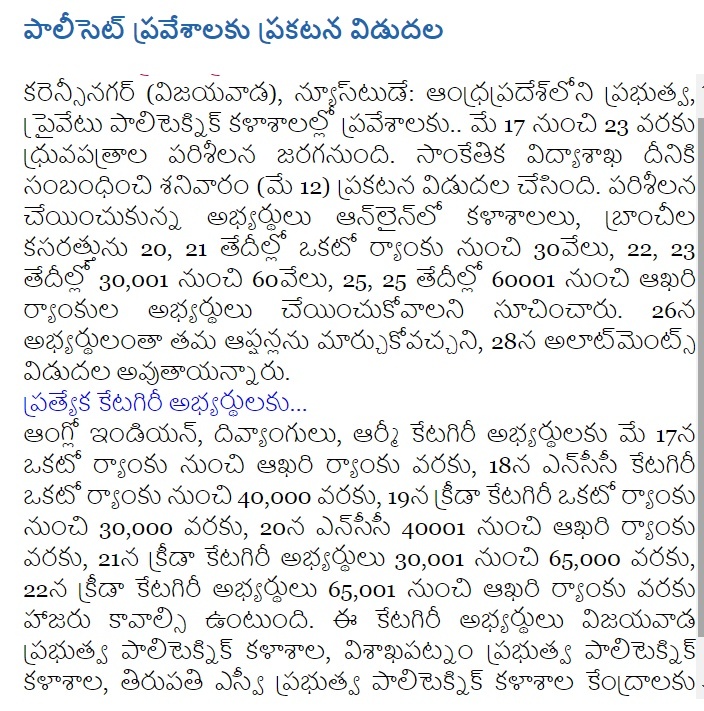 Candidates whose parents are domicile of Andhra Pradesh are eligible under CAP Category. The decision of authorities of sainik welfare of A.P is final in this matter. c. Anglo-Indian Candidates have to produce a certificate issued by Competent Authority of their place of residence. The Candidates of SC/ST category have to pay Rs. 300/- While OC/BC/Minority candidates have to pay Rs. 600/- towards Processing Fee. Tuition fee payable after allotment is Rs. 3,800 (for Government and aided Polytechnics) and it varies from Rs. 15,500 to Rs.21,000 per annum (in Private unaided Polytechnics and Second Shift Engineering Colleges).The reimbursement of Tuition fee in respect of all eligible candidates will be as per the orders issued by Government of Andhra Pradeshfrom time to time. However, all the candidates have to pay Rs.800/- towards A.P-SBTET recognition fee as prescribed. Convener Office address: O/o the commissioner of Technical Education, Flat.No:104, ANR towers, Jammichettu Street, Prasadampadu, Vijayawada – 521108. Email id : convenerpolycet2018@gmail.com. FOR ATTENTION OF APPOLYCET-2018 NOT QUALIFIED & NOT APPEARED MUSLIM & CHRISTIAN MINORITY CANDIDATES: Minority candidates who are not qualified and not appeared for AP POLYCET-2018, are informed to apply to consider them for the leftover seats if any, after exhausting all the AP POLYCET-2018 qualified minority candidates in Minority colleges.The candidates are not eligible for fee reimbursement scheme.The application shall be submitted in the proforma placed in the website https://appolycet.nic.in. The filled in application shall be accompanied with a demand draft for Rs.350/- towards processing charges and shall be drawn in favour of the secretary, AP SBTET payable at Vijayawada The application and demand draft can be submitted in person or sent by registered post/Speed post/Courier To: O/o the commissioner of Technical Education, Flat.No:104, ANR towers, Jammichettu Street, Prasadampadu, Vijayawada – 521108 on or before 17.05.2018 by 5.00 PM. LAST Means: Including not qualified/ not appeared Minority candidates in A.P-POLYCET-2018 and who have already applied to Convenor based on SSC or its equivalent examination Marks. 2. ST candidates have to attend for Certificate Verification in the Help Line Centers marked with ** only, see Annexure-II. 3. PH (Physically Handicapped), CAP (Children of Armed Personnel), Sports & Games, NCC (National Cadet Cops) and Anglo-Indian candidates should attend for the Certificate Verification at any one of the Help Line centers as shown below. PH – Physically handicapped (visual, hearing, orthopedically disabled). On the last day of schedule, options last exercised by the candidate will be frozen and candidate should take a print out. IF CANDIDATE WISHES TO CHANGE THE OPTIONS ONCE AGAIN AFTER FREEZING, CHANGEFROZEN OPTIONS ON 26-05-2018 from any HLC or Home or internet cafe. THIS IS THE FINAL OPPORTUNITY AND AFTER THIS NO FURTHER CHANGE CAN BE DONE. THE OPTIONS RECORDED IN THE SERVER ON THE LASTDAY WILL ALONE BE CONSIDERED FOR ALLOTMENT OF SEATS. 1) Allotments will be placed in Website https://appolycet.nic.in on 28.05.2018 after 06.00 PM. 3) Download the allotment order and report to the college.